Powerwatch News - 14/02/2013 - WiFi in schools - does it pose a risk? 14/02/2013 - WiFi in schools - does it pose a risk? Cringleford Primary School in Norwich is due to move into brand new buildings over the summer of 2013. Like many other councils and schools, Norfolk County Council are continuing to spend public money to irradiate the children in their care with WiFi all day every day. It is not that they are installing WiFi badly - it is that they are installing it at all, especially in primary schools. The new primary school will be irradiated by up to 19 wireless Access Points. We believe that this is a misguided choice that is damaging the health and well-being of at least some of the children. There is no way parents can choose to opt out. Parents can, and should in our opinion, opt out of exposing their children to WiFi, DECT cordless phones which transmit 24-7, Xboxes, PlayStations, Wii, etc, when they are at home. This news story will give you some of our evidence and reasons for believing such exposure will adversely affect children. At present there is no good evidence that wireless devices, though fun to use, are better educationally than using wire-networked computers that do not expose the children to pulsing microwaves all day. I am a pediatric neurologist and neuroscientist on the faculty of Harvard Medical School and on staff at the Massachusetts General Hospital. I am Board Certified in Neurology with Special Competency in Child Neurology, with Certification in Neurodevelopmental Disorders. I have an extensive history of research and clinical practice in neurodevelopmental disorders, particularly autism spectrum disorders. I recently reviewed literature pertinent to a potential link between Autism Spectrum Disorders and Radiofrequency Radiation, producing a 60 page single spaced paper with over 550 citations (1.5 MB). That is one chapter from the latest BioInitiative Report written by leading EMF/RF bio-effects researchers from around the world. The BioInitiative website has the latest update assessing 1800 new scientific studies that have been published since 2007, many showing reasons for concern. There are thousands of papers that have accumulated over decades that document adverse health and neurological impacts of EMF/RFR which can exert a disorganizing effect on the ability to learn and remember and can also destabilize immune and metabolic functioning. This will make it harder for some children to learn, particularly those who are already having problems in the first place. I urge you to step back from WiFi and instead opt for wired technologies... It will be easier for you to make a healthier decision now than to undo a misguided decision later. 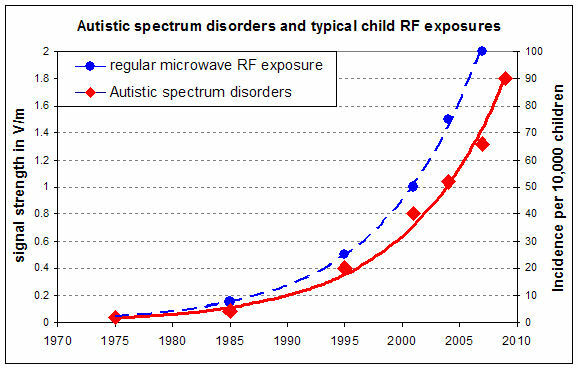 The fast rise in diagnosed autistic spectrum disorders over the last 20 years closely matches the rise in children's RF exposure. There are many factors contributing to the rise in autistic spectrum disorders (which certainly includes better diagnosis) but even when the known ones are factored out a fast rise is still seen which is due to "unknown causes". This rise is similar to the increase in children's exposure to DECT cordless phones, WiFi in the home, various PlayStation like games consoles (including Wii), parents' and now their own use of mobile phones. Data from Autism Speaks and various exposure measurement assessments. I do research on the biological effects of radio frequency radiation. The scientific evidence clearly shows that microwave radiation at levels well below [international] guidelines and at levels now commonly found inside classrooms with Wi-Fi routers causes cancer in laboratory animals, causes heart palpitations in sensitive adults, causes reduced sperm motility and viability, and is associated with symptoms of electrosensitivity that include - but are not limited to - cognitive dysfunction, pain, fatigue, mood disorders (depression, anxiety, irritability), dizziness, nausea, weakness, skin problems, and tinnitus. Teachers who complain of feeling ill in the classroom with Wi-Fi routers are often silenced. They suffer in silence until they are no longer able to tolerate the exposure and then they go on temporary or permanent sick leave. In 2011 the World Health Organization classified radio frequency electromagnetic fields as a Class 2B possible human carcinogen, which is a warning to governments around the world. Why would we want to place a possible human carcinogen in the classroom, especially when it is not necessary? History is simply repeating itself with microwave radiation just as it did with cigarette smoking, asbestos, lead and DDT. I implore you to NOT make the same mistake that we are currently making in Canada, namely installing wireless internet in all of our schools and thus exposing students and their teachers to microwave radiation all day and every school day. The worst way to connect to the internet from a health perspective is through Wi-Fi routers. Back in 2005, a number of German doctors put forward their observations of adverse health effects from radio-frequency fields to the Prime Minister of Bavaria, Dr. Edmund Stoiber. The health effects include headaches, tiredness, inability to concentrate and dizziness, and showed an alarming trend. The following graph is derived from their data. Group 1 had no symptoms of ill health (visited doctors for contraceptives or general check up, etc). Groups 2 & 3 reported headaches, restlessness, dazed state, irritability, poor concentration, learning difficulties, memory problems, fatigue, depressive mood and sleep disturbances. Groups 4,5,6 & 7 reported a wide variety of other other physical symptoms. This clearly shows why we should not be exposing ourselves and especially our children to this unnecessary pulsing microwave radiation. The original news story can be found here: Bamberg doctors' report. 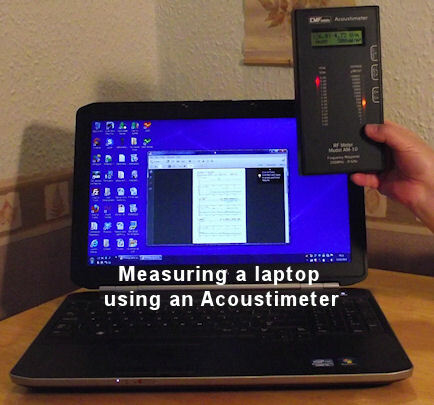 The significant exposure levels in classrooms were first widely shown to the public by me, Alasdair Philips, in the 2007 Panorama programme Wi-Fi:A warning signal (YouTube video). The measurements were made in a Norwich secondary school. The programme was widely criticised by industry and others led by the Guardian Newspaper. Our response and our measurements can be seen here. The programme prompted the UK Government to grant the HPA £300,000 of public money to investigate the microwave levels from WiFi - but they specifically forbade them to investigate any health complaints(!) and said that it was hoped that the HPA measurements would reassure parents about WiFi safety. Our attempt to change this is available here WiFi Memorandum. The HPA reported their results and actually found overall slightly higher levels than I had shown on the Panorama documentary. In 2011 they published a full paper of their results which show some significantly higher levels. 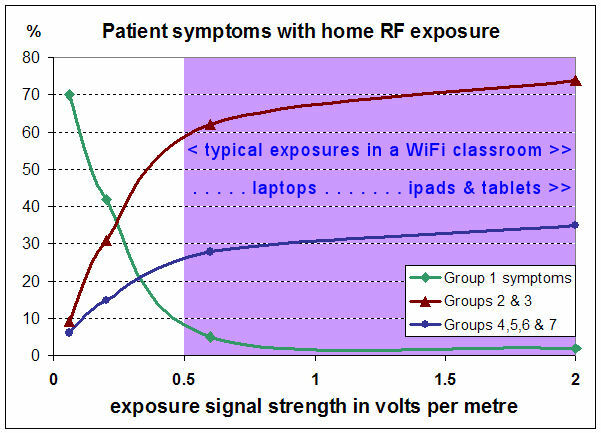 The HPA (soon to be part of Public Health England) have yet to investigate peoples' RF exposure from iPads and other 'tablets', but a senior spokesperson told me that ""we should expect them to be similar to mobile phones.". Currently schools are issuing iPads and other wireless tablets to school age children. As you can see from the above graph, their results show that we should expect health problems in the exposed children. Statement on WiFi in Schools (issued 3rd October 2012): "Adverse health effects from wireless radio frequency fields, such as learning disabilities, altered immune responses and headaches, clearly exist and are well documented in the scientific literature. Safer technology, such as the use of hard-wiring, is strongly recommended in schools." It is not just humans who suffer from exposure to low-level pulsing microwave radiation. In April 2011 the World Health Organization's International Agency for Research on Cancer classified radiofrequency / microwave exposure as a Group 2B possible human carcinogen. This requires such exposure to be considered under the EC and UK "Precautionary Principle" (PP). The European Environment Agency states that the PP provides justification for public policy and other actions in situations of scientific complexity and uncertainty, where there may be a need to act in order to avoid, or reduce, potentially serious or irreversible threats to health and/or the environment. The UK Trades Union Congress has stated that "Caution should be used to prevent exposure to substances in IARC Group 2B" possible human carcinogens. There are now scientific studies	showing easily measurable changes in blood hormone levels related to radio-frequency signals that would explain many of the debilitating symptoms commonly claimed as being due to RF exposure. Medical doctors in many countries are now developing differential diagnostic tests to identify people who are being affected by electromagnetic fields. These developments mean that legal challenges for personal injury are becoming much more likely. The current UK coalition Government has made a clear statement that they are not indemnifying Headteachers, Governors or Local Authorities from their personal and corporate duties to protect the health and well-being of the children in their care. That specifically includes the use of WiFi, wireless tablets and smart phones in school. The HPA (soon the be Public Health England) is effectively immune from prosecution. If children become ill and parents believe that WiFi is the cause, then the school Head and Governors of schools who use wireless devices are first in the legal firing line and so they should ensure that they have appropriate and adequate insurance cover. Damage from radio frequency radiation is excluded from many policies.